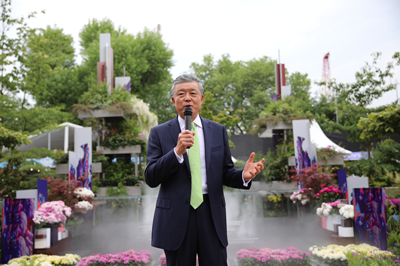 It is a great pleasure to join you at the opening of the "Wuhan Water Garden" at the 2018 Chelsea Flower Show. Britain is known around the world for the art of horticulture, and there is no better example of this than the Chelsea Flower Show, the best gardening event in the world. Once a British friend told me, two things could bring London traffic to a complete stop: a triumphant English football team and the opening of the Chelsea Flower Show. Such is the spell of the Chelsea Flower Show. Varied and unrestrained is the beauty of nature. Gardens are a reflection of one's understanding and pursuit of beauty. A beautiful garden is a perfect union of man and nature. Today, the Wuhan Water Garden opens at the Chelsea Flower Show with a magnificent display of the beautiful plants and rich culture of central China's Hubei Province and its capital Wuhan. With the unique stylised design, the Wuhan Water Garden is telling the story of China in the new era. This is a story about all-round development. Forty years ago, China began reform and opening up on the east coast. Today, the policy of reform and opening up is bearing fruits in every corner of the country. In central and western China, development has been particularly rapid in recent years. With over 21% of the total national economy, central and western China occupies an important place in the overall layout of China's economic and social development. Hubei, as a key province in central China, has achieved notable progress and displayed growing economic strength and competitiveness. Early this year, I had the honour of accompanying Prime Minister May on her trip to Wuhan, capital of Hubei Province. It was a wonderful opportunity to personally experience the charm and energy of this city at close range. It was also an eye-opener, drawing my attention to the on-going, massive and all-round opening up in China in the new era. This is characterised by efforts to generate new growth points through an opening up pattern that fosters connectivity and matches the strengths between inland provinces in the west and coastal regions in the east. The Water Garden tells a story about green development, which has been a key concept that China has adopted in a campaign against pollution to bring back the blue sky, green mountains and clear water -- to build a beautiful China. Wuhan is at the centre of the Yantze River Economic Belt, which is a strategy to foster a new engine to reduce the economic gap between provinces along this massive river. While focusing on development, this strategy also prioritises environmental protection. In the words of President Xi Jinping, protection is the way forward, not massive construction. It is from the mother river of the Chinese nation that the Water Garden takes its inspiration. It highlights the ideal of harmony between man and nature. The Water Garden also tells a story about continuation of cultural heritage. Central China, where historical Chu and present day Hubei is located, is one of birthplaces of the Chinese civilisation. The culture of Chu has always been an important part of the Chinese culture and a major contribution to the world civilisation. During her visit in Wuhan, Prime Minister May focused on cultural and people-to-people exchanges. Education, innovation and environmental protection were some of the items on her agenda. 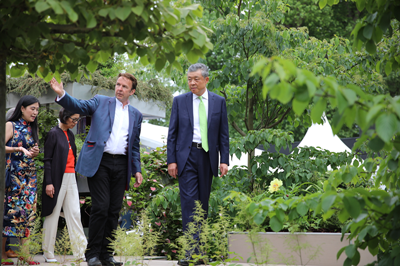 The Water Garden, which has its origin in the culture of Chu, will proudly showcase not only the best of Chinese civilisation but also the highlight of China-UK cultural cooperation. Ambassador Liu talking with Architect Laurie Chetwood, one of the two designers of "Wuhan Water Garden"
Harmony arises from the ability to appreciate different cultures for their unique beauty. Unity of man and nature is the basic principle behind the Chinese people's understanding of beauty, the soul of the Chinese garden and the wisdom of the Chinese philosophy. I encourage everyone to visit the Wuhan Water Garden to experience the charm of the Chinese garden and to appreciate the idea of "harmony of all under the sun". I hope you will join us in the lofty cause of promoting mutual learning between the East and West and advance the building of a community with a shared future for mankind. In conclusion, I wish the Wuhan Water Garden project success. 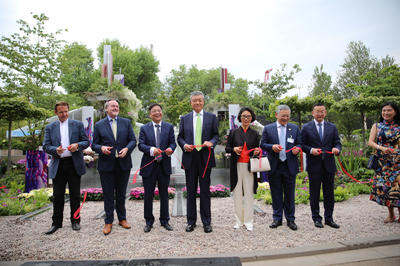 Ambassador Liu and his wife, and Mr. Michael Charlton, the UK's Chief Investment Officer of DIT (second from left) cutting the ribbon for the "Wuhan Water Garden"